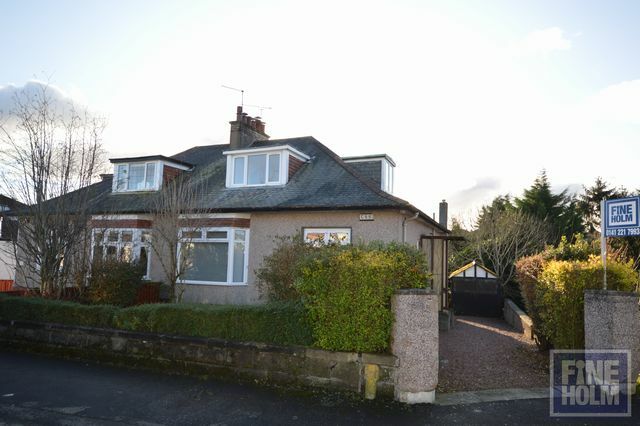 Traditional semi-detached bungalow located in this popular and sought after Netherlee locale. The accommodation comprises traditional style reception hallway, generous formal lounge with bay window, lovely double bedroom to front, spacious bedroom/dining room to rear, main family bathroom with overhead shower, fitted kitchen with a range of wall and base mounted units. Upstairs provides superb double bedroom, additional double bedroom/home office and storage cupboard adjacent. Generous garden ground with a small front garden and large lawned area and patio area to the rear. Driveway and detached single garage. Netherlee is very popular with young growing families enjoying access to some of the best schooling within the local area, notably Netherlee Primary School, OLM, St Ninians Secondary School and Williamwood High School.